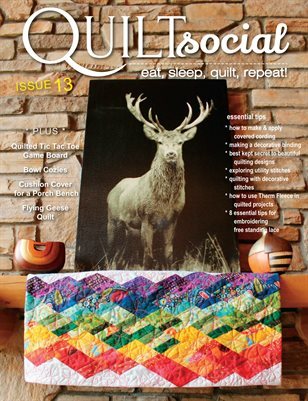 Welcome to another thrilling issue of QUILTsocial! In this issue we show you ways to explore and use utility and decorative stitches for quilting your quilt and sewing on your binding. Using these stitches for quilting is an underrated method, but highly effective. We encourage you to choose any built-in stitch to add oomph to your binding, see the various stitch-outs. We also show you how to make and apply covered cording like a pro, the tutorial includes how to round the corners for a truly elegant finish. Another tutorial in this issue is how to work therm fleece into quilted projects, like the bowl cozy. Other free projects include the tic tac toe game set - all quilted using the latest Recess line from Banyan Batiks, and the quilted bench cushion cover. We take a close look at some awesome features on the Brother Dreamweaver XE and the ImageStitch app and the mysewnet on the PFAFF creative icon. Download this stunning issue!